It takes a lot of ministers working together to make Mass a beautiful experience, and you see most of them in action each week: lectors, Eucharistic ministers, ushers, altar servers, and musicians. But there is one minister who you do not see each week: the person running our AV projection. We call these AV ministers, AVengers (because they are heroes! ), and they are enhancing Mass behind the scenes each week. We have come to just expect projection at every Mass and perhaps take it for granted. However, what would Mass be like without it? 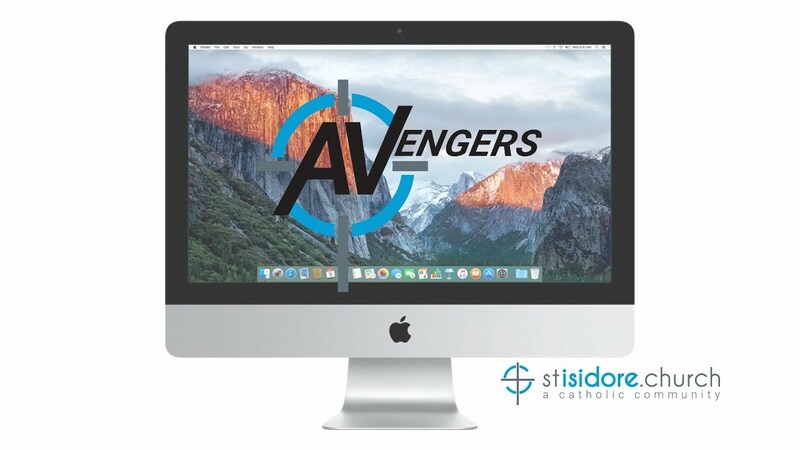 The AV Ministry has become such a vital part of our liturgies at St. Isidore, but we really need some help! Anyone can do this ministry, regardless of your age (high school and up) or experience with computers. There is also flexibility built into this ministry in both scheduling and operation. You can serve at whichever Masses work best for you and can run slides from either the computer in the booth or from an iPad in the pews so you can sit with family. But what about cameras and baptisms? When there are baptisms, AVengers are responsible for operating and projecting the cameras so everyone can share in this beautiful sacrament at Mass. Though this requires some extra steps and training, camera operation is much simpler than it might seem. If you are willing to help us out in this ministry, we can set up one-on-one training and shadowing until you are comfortable. To sign up and serve as an AVenger today or to learn more just fill out this form below. Questions? I’d be happy to chat with you more about this ministry. Don't worry, it doesn't matter where you think you rank, we can make it work! Select as many as you are willing. Yes! Put me in, coach! I think so but have some questions. Please contact me first.